Poblanos are dark green chili peppers approximately 4-5 inches long and 2 ½ -3 inches wide. Poblanos are the “bell pepper” of Mexican cuisine. Poblanos are triangular in shape and flatter than bell peppers. They are also less sweet, more savory and hotter. Their heat level can vary but usually they are in the mild to medium range. They are perfect for individuals who like a little bit of spiciness but not too much heat. If left to ripen they turn a reddish brown and become sweeter than the green ones. Dried Poblanos are known as anchos. Anchos are sometimes mistakenly referred to as pasillas which are actually dried chilaca chiles. Like all fresh peppers, choose poblanos that have firm, smooth skins, devoid of any wrinkling or noticeable bruises. They can be stored in the fridge for up to a week. Anchos can be stored in an air-tight container for months. Poblanos are available year round but their peak season is summer and fall. As stated, poblanos are very popular in Mexican cuisine. Indeed, they are the workhorse of the Mexican kitchen. They are often roasted, which accentuates their deep flavor even further. After roasting, their skins and seeds are removed. Sometimes they are then cut into strips called rajas, and added to any number of dishes. To roast them, place them under the broiler, on a grill, or directly on a gas burner. Turn them as each side turns black. Remove them from the heat and let them steep in a covered container. This facilitates removal of the skin. Copyright 2012 Christine's Pantry. All rights reserved. In a large pot, heat oil over medium heat. Add ground chicken, salt, pepper and Worcestershire sauce, breaking meat up, cook until no longer pink. Add onions and poblano pepper, cook for 2 to 3 minutes. Add remaining ingredients, stir well. Reduce heat to low and cook for 30 minutes. Enjoy! 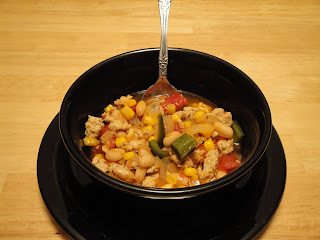 I love chicken chili! It's so comforting and filling! Great recipe! Great combo and so flavorful! I'm sure the fire roasted tomatoes added great flavor to this lovely dish .. I didn't know they got sweeter as they ripened, not did I know ancho chilies were just dried poblanos. Learn something new every day! My husband is a pepper genius. I am going to use your facts to test his knowledge. Great post! Whew, I'll be that's spicy! I would love a bowl of this! This looks fantastic. I make a chicken chili with green chili peppers. It's so nice to have a change from the typical ground beef and tomato version. I've yet to make chili this year, don't know what I'm waking on. Saving your recipe. I have never had chicken chili. I need to try it out. Looks delicious!